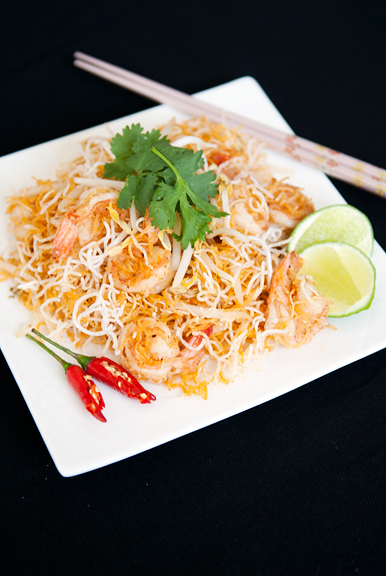 I first had mee krob at Min’s in La Cañada, California and was hooked ever since. 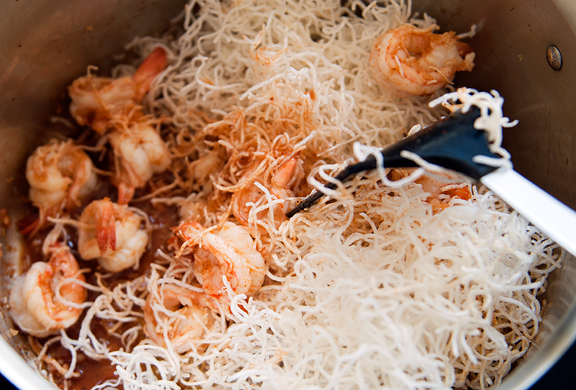 It’s a sweet, tangy, crunchy, savory appetizer of rice noodles (deep fried) with shrimp. It is unclear at what point a dish goes from seeming inaccessible to suddenly doable in your own kitchen. I never thought that I could make mee krob until recently when I looked at the recipe (which I’ve perused in the past) and it just sounded simple and easy. The biggest drawback to making mee krob is the frying. I hate to fry stuff. It makes a mess and the oil is hot and I always manage one or two burns. 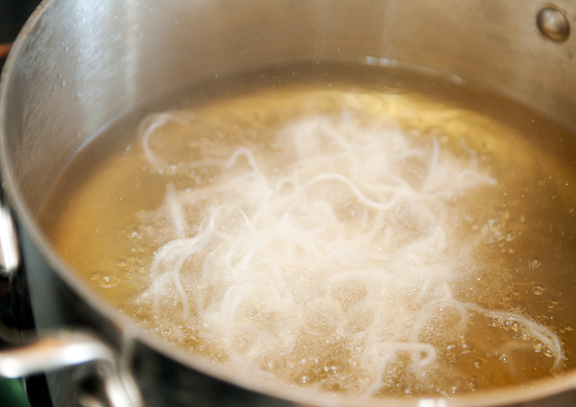 I have to admit though, frying the rice noodles is totally fun (get it? fun? the Chinese kids will get it) because they puff up into this mess of squiggly crunchy fried things. It helps A LOT to have a mesh skimmer dealio with which to scoop and strain the crispy squigglies. From there, the rest is straightforward and quick. Although the recipe calls for pouring a beaten egg into the hot oil to fry into shreds, I skipped that part – mostly because I forgot. Stir fry the shrimp (butterfly them before cooking to make them pretty) and dump everything else into the pan and you’re all set. Dare I say it? I think this is as good as Min’s. The first time I made it, the noodles sogged up a bit while I was photographing the process. The second time (yeah, it was that good) it was a good balance of crunchy and chewy with that whole spectrum of flavors square dancing in my mouth. Even though it is generally listed as an appetizer, we had it for lunch both times. Phew! Saved me a trip to Southern California – but I won’t stop going! 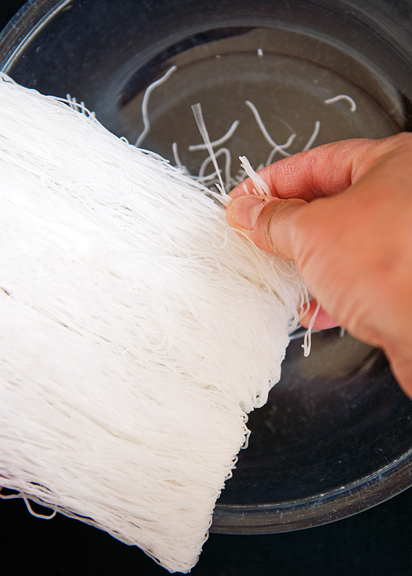 Break the rice vermicelli apart by hand so that they are separated and not some tangle of a mess. Heat the oil for deep frying (about 2 cups in a medium saucepan). It’s ready when you drop a rice stick in and it floats to the top. 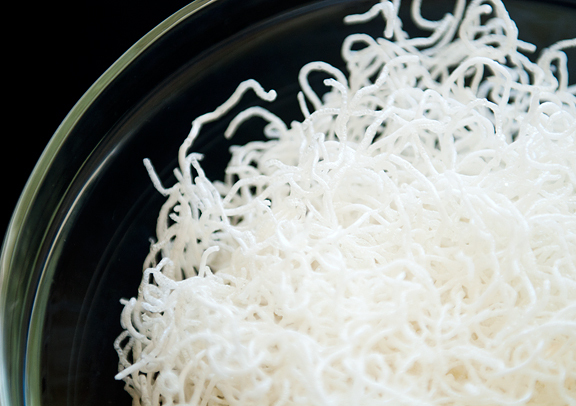 Place a handful of rice vermicelli in the hot oil (not all at once!) and remove them as they float to the top and set aside on paper towels. If the noodles are burning then reduce the heat. Fry all of the noodles this way until you are done. Reduce heat to medium. 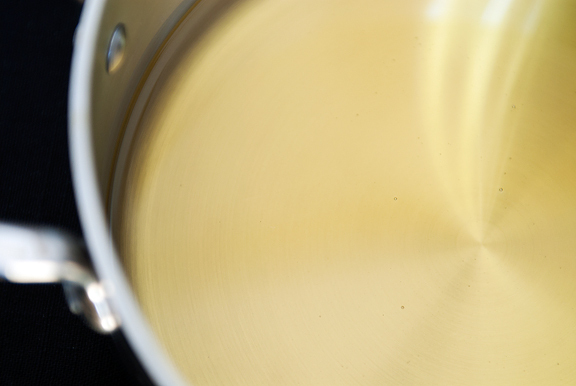 If using egg, slowly pour the egg into the oil and fry until the shreds become golden. 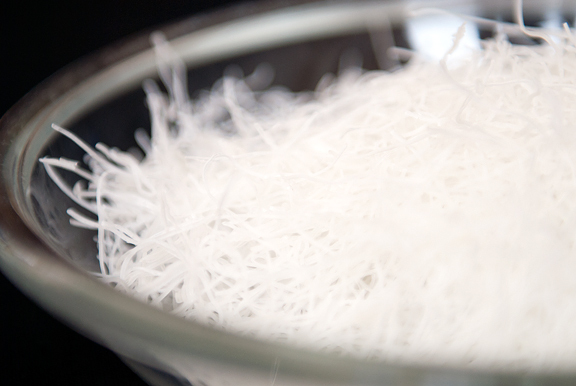 Remove from oil and place on paper towels. 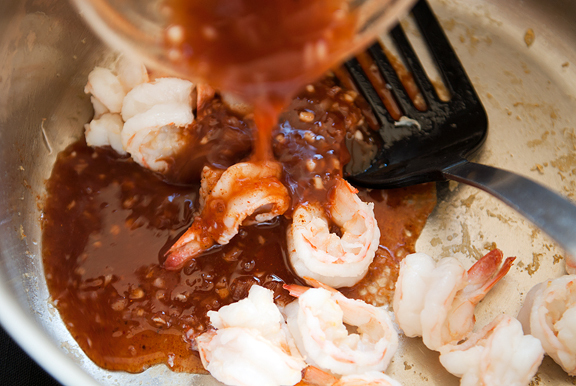 In a frying pan or wok, heat a tablespoon of the oil and stir-fry the shrimp until they begin to turn white. 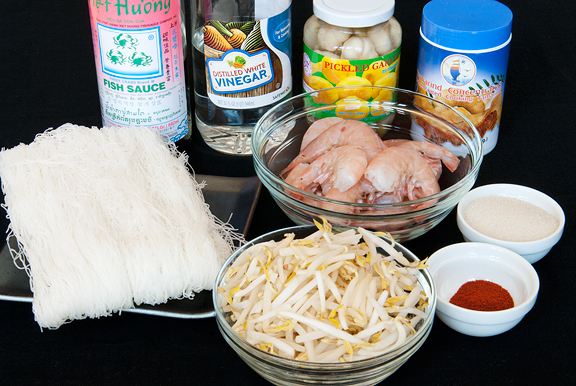 Add the fish sauce, vinegar, tamarind juice, sugar, paprika, preserved garlic, rice vermicelli, egg, and bean sprouts. Stir until everything is evenly coated with the sauce. Serve. 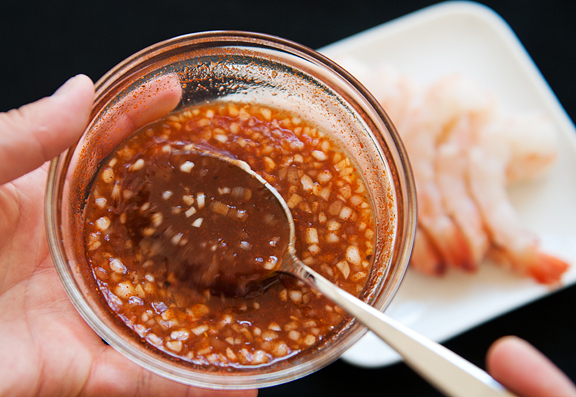 that sauce looks STELLAR! I can just see the heat and flavor in it….wow, delish! 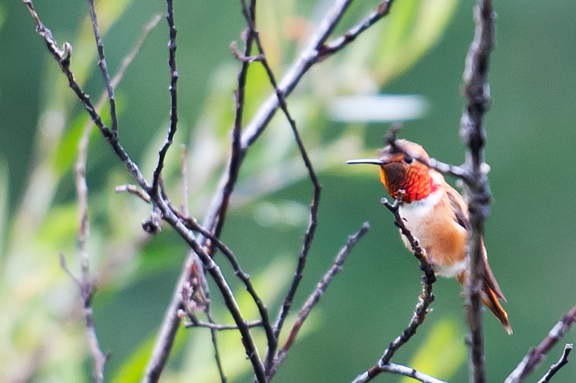 And I love your photos of your latest trip, especially the Hummingbirds. 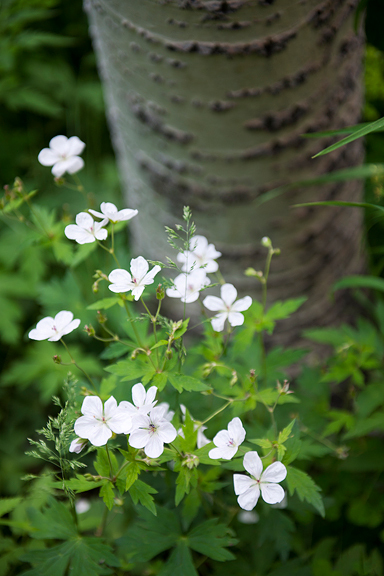 I have been enjoying your photos from Crested Butte so much! Gorgeous! mostly because you forgot…ha! I think my kids would love this if I could get over my aversion to frying. I need a better vent hood, one that vents outside. We are currently visiting colleges, & good Asian restaurants within walking distance of campus is high on my daughter’s list of requirements. I just fainted reading this. L.O.V.E. Your photos are absolutely stunning. Really, they inspire me to want to learn how to take better pictures. 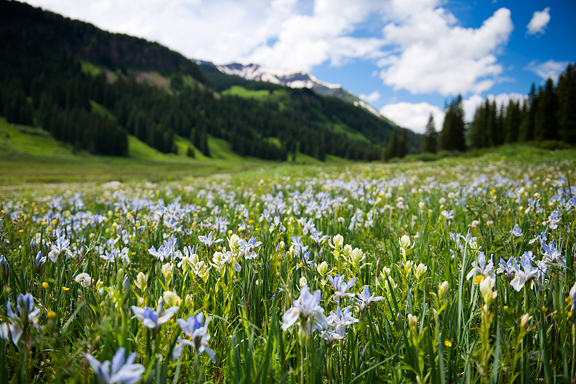 Crested Butte is so beautiful…I’ve never been there, I’m just going by what I see here and wow, I would love to visit there. 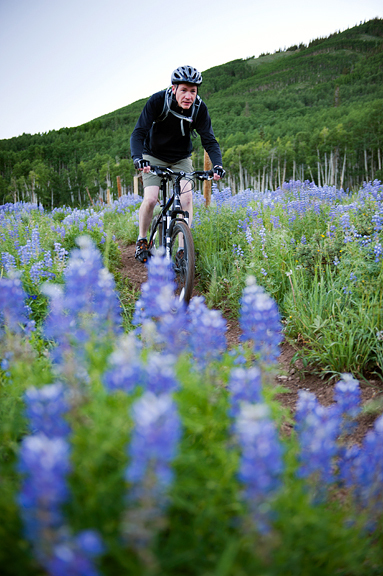 My husband would LOVE the mountain biking! 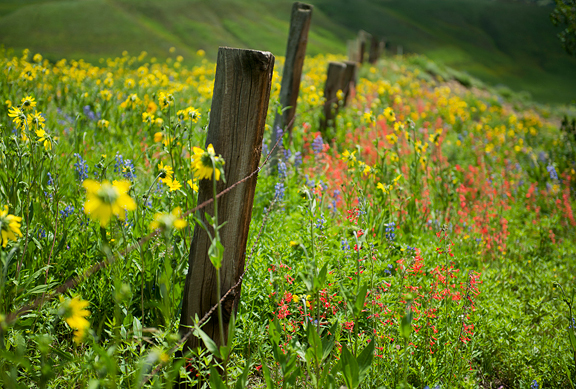 My favorite photo on this post is the one of the wildflowers with the fence…so beautiful! Mmm, thank you for including gram weights! Also, this post was funny to me because a friend of mine just started a physics blog, and this is the name he picked for himself: http://freelanceastrophysicist.com/ His tagline is “real science, reasonable rates” which cracks me up every time. You have such beautiful adventures, thanks for sharing. 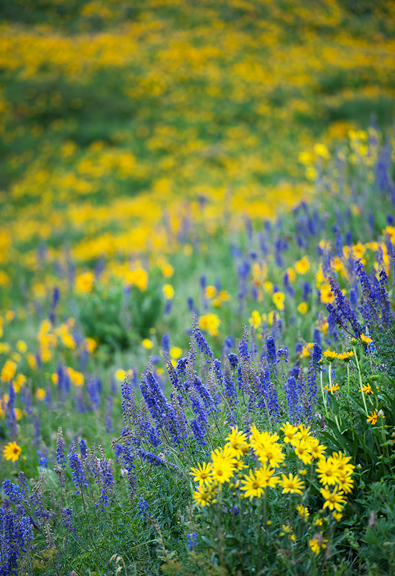 Wow, your photos from Crested Butte are wonderful! 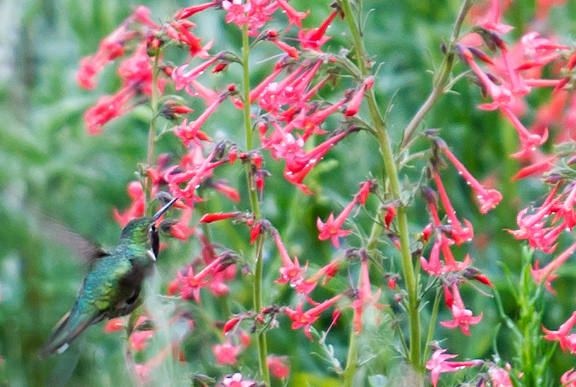 Love the hummingbirds and wildflowers. The Mee Krob looks tasty too! Jen, your photos are so good (as always)! Crested Butte is a fantastic place. And the recipe…. wow! Thank you for sharing. I’m pretty sure this is a must-do. Actually, I’m darn sure of it! putting this on my ‘must go to’ list. love all Asian foods as well. I’m with ya. loving the thought of making this dish. Now this is one Thai appetizer I have not had before! I love seeing the Thai food essentials in the last photo. Chili padi, lime and cilantro! and your site is one of my favorites as well! All the best to you. That looks great! I love the recipe. Oh how I miss Min’s! This looks soooooo tasty! 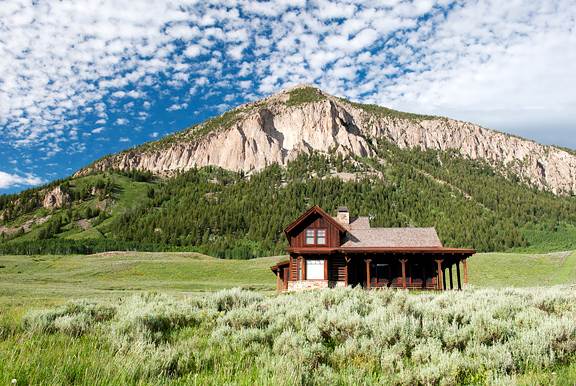 This makes me want to visit Crested Butte! Your photos are stunning. My favorite! Our noodle place doesn’t carry it anymore. They said it was too hard to make. I’ll definitely have to try it! 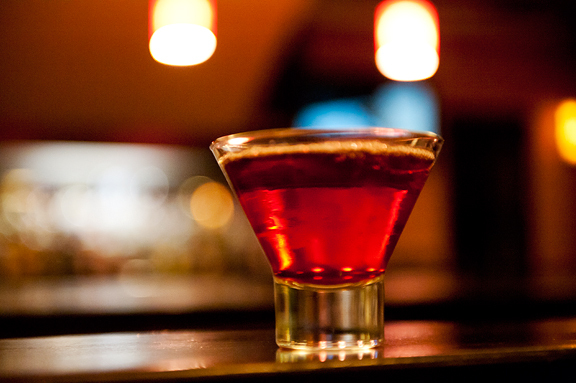 Averie – actually, it’s not hot at all – but it’s good. Kristin – you raised your daughter so well!! ailo – ugh, did I miss him already? Well, I think LoBar and Secret Stash are a must. Good food (sushi and pizza respectively). 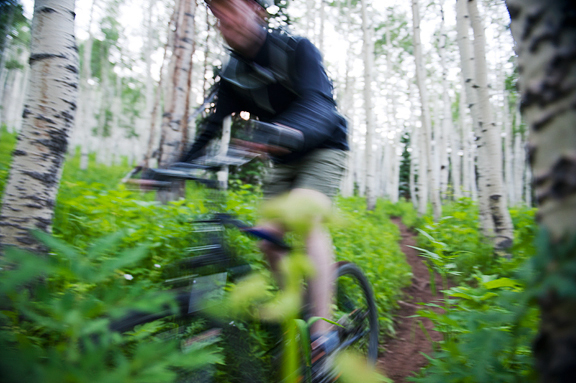 He should drop by the visitor center and get a biking trail map. Lots of great trails of all levels of difficulty. Rachael – bummer you’re missing out this year, you’ll just have to visit 2x as long next year, right? That looks delicious. I love crispy noodles. And your photography is stellar as usual! Hi Jen – My boyfriend got back from his trip, and he loved Secret Stash – even brought me back a menu – so I think that was a good recommendation :) And now he wants to move there, so I guess you’re not alone! I tried this and it was delicious but my noodles got soggy by the time I had mixed everything in the sauce. Is there a wrong kind of noodle to use? Jessica – yeah, I don’t know how to remedy that. Mine got soggy too. I think you have to eat them right away. I’m a chinese kid and when I read that I giggled too. 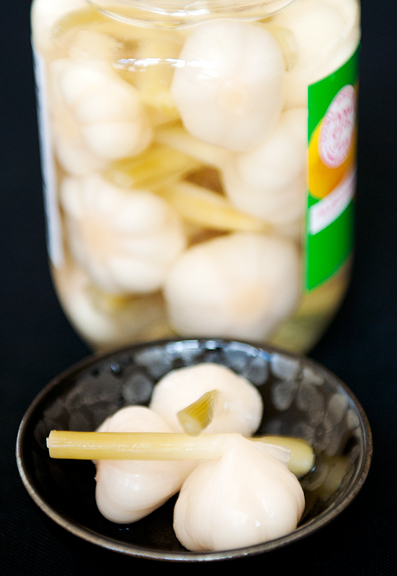 If I don’t have pickled garlic can I make my own or can I just use real garlic? Janet – I think regular garlic would be way too strong for this. You can try to make your own (look up a good recipe)? Thanks for the receipt, do you also have a version that has chicken & water chestnuts (no red sauce)? Vivian – I do not. I have never heard of that before, but it sounds lovely!